Printing and Mailing Services for Voter Registration Certificates and Address Confirmation Forms for the County of El Paso Blanca 09/27/2018 at 2:00 p.m. 18-042 Bid was awarded by Elections Department on Tuesday, January 8, 2019 to QuestMark Information Management, Inc.. Secure and/or Staff-Secure Residential Treatment Services for Post-Adjudicated Youth Oscar 09/27/2018 at 2:00 p.m. On Monday, October 15, 2018 Commissioner's Court approved and authorized to reject all responses and end the procurement process. 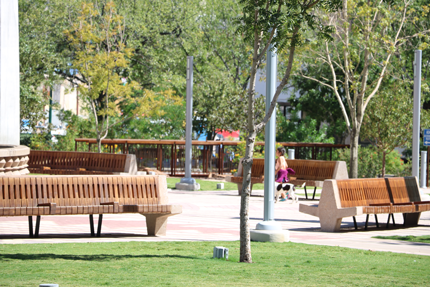 Addendum 1 Investment Advisory and Management Services for the County of El Paso FY2018 Araceli 8/16/2018 at 2:00 p.m. On Monday, March 11, 2019 Commissioner's Court awarded the RFP to Hilltop Securities Asset Management of Austin, TX. Bid was awarded by Commissioner's Court on Monday, September 10, 2018 to TAO Industries Inc. dba Hawk Construction. Addendum 1 Professional Services for the study of Project Needs of The Downtown Jail Facility Araceli 7/26/2018 at 2:00 p.m. On Monday, March 11, 2019 Commissioner's Court awarded the RFP Hellmuth, Obata & Kassanbaum, PL (HOK) of Dallas, TX. Addendum 1 Online Enrollment & Benefit Administration System for the County of El Paso Araceli 7/26/2018 at 2:00 p.m. On Monday, October 1, 2018 Commissioners Court awarded the RFP to T.E.B. Benefits Group Inc., El Paso TX . 18-033 Bus and Fleet Vehicle Maintenance and Repair Services for the County of El Paso Oscar 7/5/2018 at 2:00 p.m. 18-033 Bid was awarded by Commissioner's Court on Monday, September 10, 2018 to both L-Tune Automotive Center and to Lube-Tune. 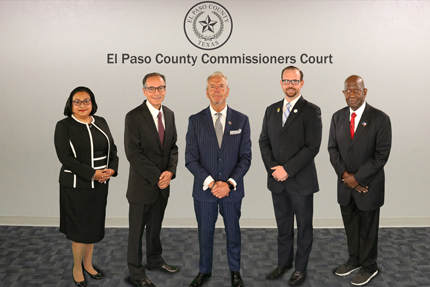 18-032 Indigent Burial Services for the County of El Paso Oscar 6/28/2018 at 2:00 p.m. On Monday, September 10, 2018 Commissioner's Court approved and authorized to end the procurement process and re-solicit. 18-031 Provider of Prescription Drug and /or Dental Care Discount Cards for the County of El Paso Araceli 6/14/2018 at 2:00 p.m. On Monday, June 25, 2018 Commissioner's Court approved and authorized to reject all responses and end the procurement process. Replace Existing Generator and Automatic Transfer Switch at the County of El Paso Medical Examiner's Office Blanca 05/17/2018 at 2:00 p.m. 18-029 Bid was awarded by Commissioners Court on Monday, June 26, 2018 to El Paso J.A.G. Inc. Vendor Sign-In Sheet Removal of Old Irrigation Pumps and Installation of New Irrigation Pump System for Ascarate Golf Course Oscar 05/17/2018 at 2:00 p.m. 18-028 Bid was awarded by Commissioners Court on Monday, June 18, 2018 to Watertronics LLC. Addendum 1 Up to 20,000 Tons of Paving Rock Grade F and Up To 12,000 Tons of Raving Rock Grade C for the County of El Paso Blanca 05/10/2018 at 2:00 p.m. 18-027 Bid was awarded by Commissioners Court on Monday, June 18, 2018 to Jobe Materials, L.P..
18-026 Paving Emulsion Material for the County of El Paso Blanca 05/03/2018 at 2:00 p.m. 18-026 Bid was awarded by Commissioners Court on Monday, June 11, 2018 to Holly Frontier Refining & Marketing, LLC..
18-025 2018 Paving Project for the County of El Paso Oscar 05/03/2018 at 2:00 p.m. 18-025 Bid was awarded by Commissioner Court on Monday, June 11, 2018 to JAR Concrete Inc. d/b/a JAR Construction Inc.
Addendum 1 Purchase, Delivery and Installation of Eight (8) Energy Star Certified Manufactured Housing Units (MHU) for the Colonia Self Help Center Oscar 04/26/2018 at 2:00 p.m. 18-024 Bid was awarded by Commissioner Court on Monday, June 11, 2018 to Clayton Homes #861. Purchase of a Central Access and Security Control System, Equipment & Services for Various County of El Paso Buildings Araceli 08/16/2018 at 2:00 p.m.
Addendum 1 Copy Paper, Carbonless (NCR) Paper and Envelopes for the County of El Paso Blanca 04/12/2018 at 2:00 p.m. 18-019 Bid was awarded by Commissioners Court on Monday, June 18, 2018 to Olmsted Kirk Paper Co. and Spectrum Paper Co. Vendor Sign-in Sheet Replace Emergency Diesel Fire Pump at the County Courthouse Oscar 04/12/2018 at 2:00 p.m.
On Monday, January 28, 2019 Commissioners Court approved and authorized to close out the bid and end the procurement process. Bid was awarded by Commissioners Court on Monday, June 4, 2018 to Reycon Construction Solutions. Addendum 1 Employee Uniforms, Juvenile Uniforms, Bedding, and Practice Rifles for the Juvenile Probation Department Oscar 03/29/2018 at 2:00 p.m. 18-016 On Monday, July 23, 2018 Commissioner's Court approved and authorized to reject all responses and end the procurement process. 18-015 Legal Services for the County of El Paso Community and Corrections Department Araceli 03/15/2018 at 2:00 p.m. 18-015 On Monday, May 21, 2018 the CSCD requested to close out the RFQ and end the procurement process. Addendum 1 Leasing of Unmarked Vehicles for the County of El Paso Oscar 03/08/2018 at 2:00 p.m. 18-014 Bid was awarded by Commissioners Court on Monday, June 4, 2018 to EAN Services, LLC., dba Enterprise Rent-A-Car. Attachment 1 Prisoner Extradition and Transportation Services for the County of El Paso Araceli 03/01/2018 at 2:00 p.m. 18-013 On Monday, May 14, 2018 Commissioner's Court approved and authorized to reject all responses and end the procurement process. 18-012 As-Needed Surveyor Services for the County of El Paso Araceli 2/22/2018 at 2:00 p.m. 18-012 RFQ was awarded by Commissioners Court on Monday, June 4, 2018 to Huitt-Zollar Inc.
Addendum 1 Purchase of Nine (9) to Eleven (11) Law Enforcement (Police) Motorcycles with Nine (9) Trade-in Motorcycles for the County of El Paso Oscar 02/08/2018 at 2:00 p.m. 18-011 Awarded to Barnett Harley-Davidson, Purchase Order date April 04,2018. Total price less than $50,000.00. the El Paso County Colonia Self Help Center Program Blanca 01/25/2018 at 2:00 p.m. 18-010 On Monday, March 19, 2018 Commissioners Court approved to close out and re-bid. Vendor Sign-in Sheet Rehabilitation of Five (5) Single Family Housing Units Located in the Colonias of Horizon View Estates and Agua Dulce Oscar 01/18/2018 at 2:00 p.m. 18-009 On Monday, March 19, 2018 Commissioners Court approved to close out and re-bid. Uniforms, Body Armor and Badges for the County of El Paso Sheriff's Office Oscar 12/07/2017 at 2:00 p.m. 18-008 On Monday, December 17, 2018 Commissioner's Court approved and authorized to end the procurement process and re-solicit. 18-007 Purchase of Twelve (12) Police Interceptor Utility (SUV) AWD Patrol Vehicles and One (1) Full Size Pursuit Vehicle (2 WD SUV) for the County of El Paso Blanca 12/07/2017 at 2:00 p.m. 18-007 Bid was awarded by Commissioners Court on Monday, January 29, 2018 to Rudolph Chevrolet and Silsbee Ford. at 2:00 p.m. 18-006 RFP was awarded by Commissioners Court on Monday, June 11, 2018 to The Network d/b/a Dover, Kohl & Partners. Addendum 1 Purchase of One (1) 6K Forklift with Liquefied Petroleum Gas (LPG) Powered Engine for the County of El Paso Purchasing Department Blanca 11/30/2017 at 2:00 p.m. 18-005 Bid was awarded by the Fleet Department on Wednesday, January 24, 2018 to FMH Material Handling Solutions, Inc.
18-004 Purchase of Two (2) Midsize Sedans and One (1) Full Size 4X2 1/2 Ton Pickup Truck Crew Cab (4 Full door) Short Bed for the County of El Paso Blanca 11/30/2017 at 2:00 p.m. 18-004 Bid was awarded by Commissioners Court on Monday, January 29, 2018 to Casa Ford and Sam Pack Five Star Ford.. Remote Monitoring and Management System for the County of El Paso Lucy 2/08/2018 at 2:00 p.m. On Monday, March 19, 2018 Commissioners Court approved to close out the RFP. Ink and Toner Cartridges for the County of El Paso Blanca 11/02/2017 at 2:00 p.m. 18-002 Bid was awarded by Commissioners Court on Monday, February 12, 2018 to Beyond Technology, CVR Computer Supplies, Dream Ranch Office Supplies, El Paso Office Products, Enhanced Laser Products, Pencil Cup Office Products, Inc., Rapid Refill, Rasix Computer Center, Inc., Ready Data, Inc., Shelby Distributions, Inc., SHI Government Solutions, Southern Computer Warehouse, Inc., Supplies Hotline Corporation, The Office Pal and The tree House Inc. Bond Underwriter Services for the County of El Paso Blanca 11/09/2017 at 2:00 p.m. Bid was awarded by Commissioners Court on Monday, November 27, 2017 to Ramirez & Co, Inc., Citi Group Global Markets, Inc., Siebert, Cisneros, Shank & Co., LLC., Hilltop Securities Inc., Merryll Lynch, Pierce, Fenner & Smith, Inc., Piper Jaffrey & Co., RBC Capital Markets, LLC.